This nightlight includes a snap on mounting clip for holding a wood cutout. Attach wood cutout with glue or drill hole in clip and attach with 1/4" screw which is included. 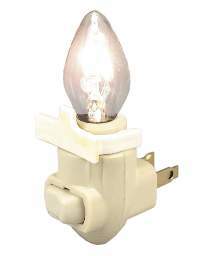 Nightlight Kit includes 4 watt clear bulb, clip and 1/4" screw.